I had a disk fail on a RAID5, and then simultaneously one of the good remaining disks fell out of the array. Apparently it's a known issue with this model of drive. I confirmed all the disks are good. I can see the original c array, but when I open the LVM components tab I can't choose the volume that fell out of the array. I can't figure out how to get this disk back in there. System info: Tools -> Save system info. There will be two files. 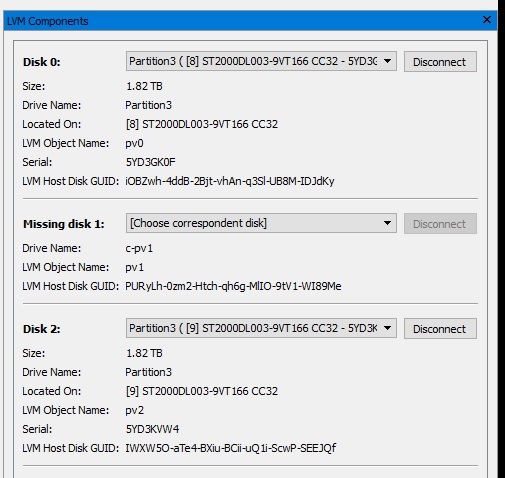 A screen shot of the Drives panel, and list of disks that are from the RAID, and the disk that you cannot find in the dropdown menu. Please zip them and send to raptorbck (at) gmail (dot) com . This information will not contain any data, only the information about your system hardware and disk partitioning. We've received it, and I've sent all the data to our developers.